And it is much needed: During the financial crisis in Europe, Vodafone lost millions of customers who found that other brands did not only have lower prices, but often also better service. It took time for Vodafone to react, but Project Spring is now addressing the investment backlog of Vodafone. It’s nice to see that the investments and the focus are leading to an improvement of Vodafone’s network KPIs. To convey that message, Vodafone Group is reporting network quality KPIs that most other operators have never communicated: Dropped call rate is one. The graph above is from Vodafone’s latest quarterly result presentation. 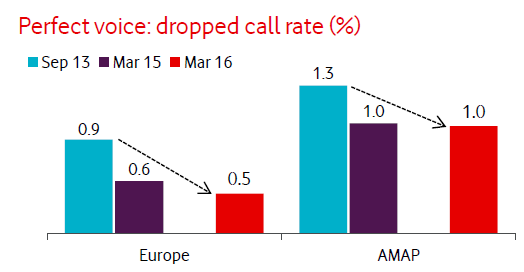 It shows that for Europe, Vodafone targets a 0,5% dropped call rate for March 2016. Since tefficient’s benchmarks run with a strict confidentiality on both participant identity and data, we couldn’t publish any numbers without the consent from the participants in question. We didn’t get it from all, but from many. In the graph below, Vodafone’s reported dropped call rate numbers for the UK, Spain, Italy and Germany are compared with those Nordic networks where we did get a consent. The dropped call rates in all four Vodafone networks have improved. Germany, Italy and Spain were close to 0,6% last quarter. UK was on 0,8%. 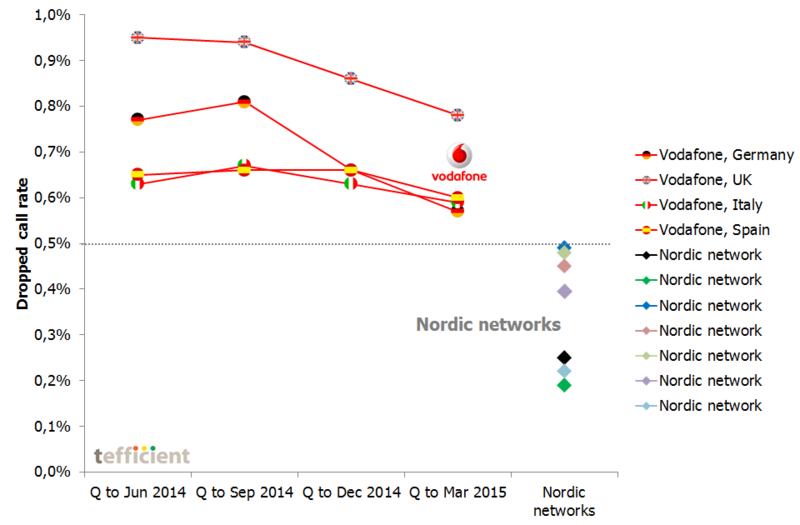 All of the Nordic networks had a lower dropped call rate than 0,5% in 2014, though. The Nordic networks with the lowest dropped call rate were around 0,2%. And everyone is still improving. On one hand we want to praise Vodafone Group for its initiative to report network quality KPIs (like dropped call rate and data throughput) alongside data usage and customer churn. On the other hand we think that Vodafone’s 0,5% target for “perfect voice” in Europe is relaxed. To inspire, we could mention that the average customer of the Nordic operator with the lowest dropped call rate – with their average voice usage – experiences a dropped call only once every fifth month. Is this perfect voice? Not yet, but it’s inspiring. In its strategic plan – Essentials2020 – presented in March, Orange Group dared to communicate a zero dropped calls vision for 2018. 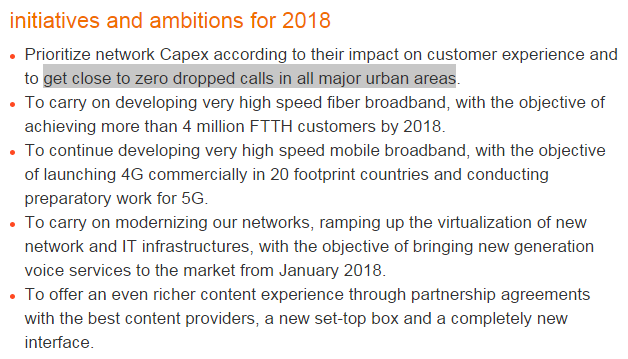 Orange’s use of words – “close to”, “major urban areas” – suggests we won’t actually have zero dropped calls in 2018, but it’s an inspiring vision. Previous PostNetwork sharing JV benchmark 2015Next PostMobile consolidation: Less is more?